We had been assured that the last visit of the trip to Alsace would be different and challenging; and so it was. Agathe showed us into a huge old dining room, on such a hot day the high ceilings and shaded outlook was wonderfully cooling. Helen took on the task of translation and did so magnificently. Agathe’s somewhat sad family and vinous background has clearly been turned around by her. The family grandfather tragically died in an accident in 1939 and a family left with no traditional ‘man in the house’ let its’ grapes go to the local co-operative. Amazingly Agathe’s grandmother insisted she smelled fruits and flowers blind, tasted food ingredients blind and these seemed to have driven her to pursue flavours in wines. This combined with a tough school and some early tasting experiences planted a seed in her mind. 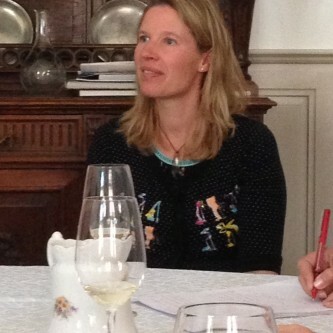 Wine making education in Bourgogne, experience in Chablis and the Rhone, especially with white wines, form the backdrop to her efforts now in Alsace. She only has a small domaine; in 2000 taking 3ha back from an uncle to whom it was rented; then accruing small plots to now be at 6ha. Annual production is 32,000 bottles, 40% export, 30% to the trade and 30% to customers in France. It seems fair to say that she has virtually no wine in her cellars for sale! Agathe ‘does everything’; out at 0515 to 1100 in the vineyard, then to her cellars and paperwork to run the business. We asked about MLF and she responded ‘no, unless it just happens’. Her rootstocks were unknown and suggested she would ask when in heaven. 1. L’As de B 2014 co-planted Sylvaner, Muscat, Pinot Blanc, Gewurztraminer, Pinot Gris and one vine of Pinot Noir. 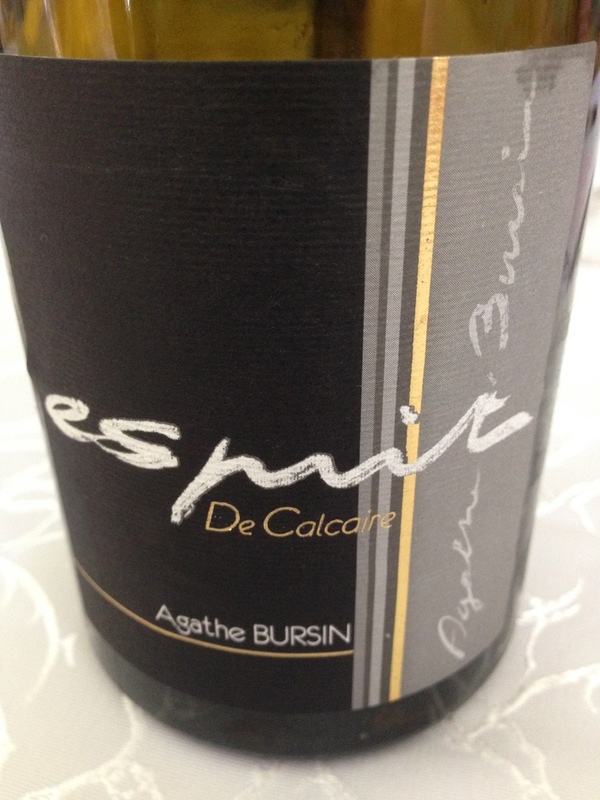 Agathe describes the ‘firework of aromas’ from this entry-level wine with 9g/l of sweetness. Interestingly this wine had quite a lot of tartrate crystals that Agathe said she would not take steps to precipitate. 2. Muscat 2014 from Bollenberg, 80% Ottonel giving light white flower aroma, 20% Alsace giving perfumed aromatics. 3. and 4. Sylvaner 2014 – two parcels of land that face each other; one SE facing and the other SW; one with morning sun and one afternoon sun. The morning SE parcel produced the sweeter style with a longer back palate, the SW a dryer wine with lighter fruits. 5. and 6. 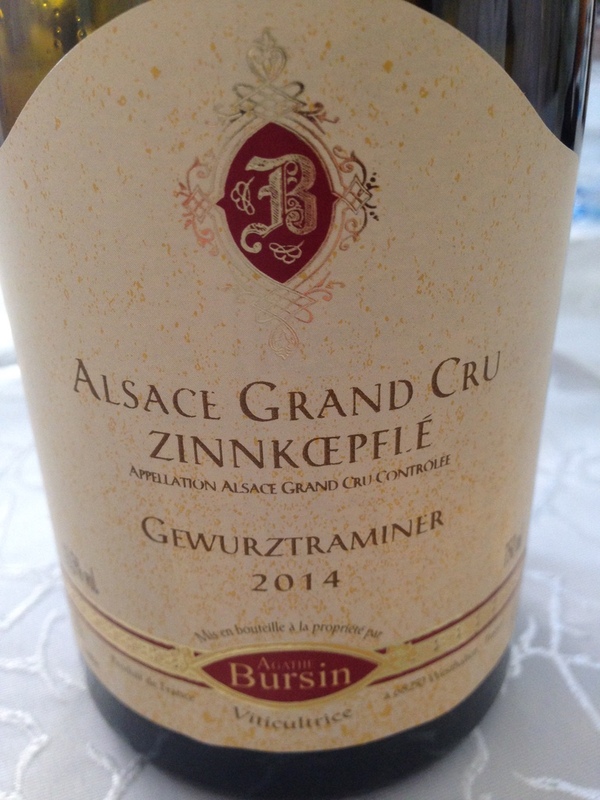 Pinot Gris 2014 – reflection of the respective terroir. The first from red sandstone with silky acid on the cheeks; the second from limestone was crisper, cleaner with acid felt on the lips. 7. L’Esprit de Calcaire 2012. Pinot Gris 33%; Sylvaner 33%; Rielsing 34%, aged in barriques for two years 2nd and 3rd fill. MLF yes by virtue of it just happening and fermenting to 0g/l. 8. Pinot Noir 2013. It was lovely to hear the commentary on winemaking – stainless steel at the start of fermentation for eight days with pigeage twice a day. Into Bourgogne barrels for the remainder and MLF, left on the lees for texture; lees giving reductive effect balanced by oxidative effect of barrels, no racking only topped up every week. 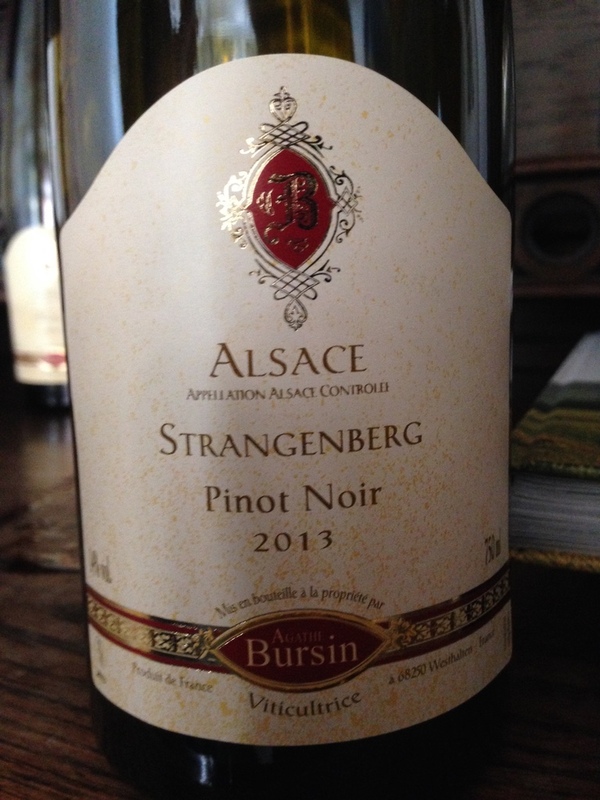 This was one of the two best Pinot Noirs we tasted during the trip. 9. Riesling barrel sample from Zinnkoepfle due to be filtered this week (20 July) and bottled on the 5 Aug.
10 Gewurztraminer GC Zonnkoepfle 2014. A very much lighter style, far more like a NZ Gewurztraminer than we had tasted so far. My own thoughts are of being inspired by Agathe with her determination and passion to follow her instinct. If the proof of the pudding is in the eating then her wines sell out quickly irrespective of the unusual nature of some of the aromas and flavours. I rather like it when someone kicks back and challenges our preconceptions. Thank you Agathe. Thanks, Ian for a lovely perceptive report. 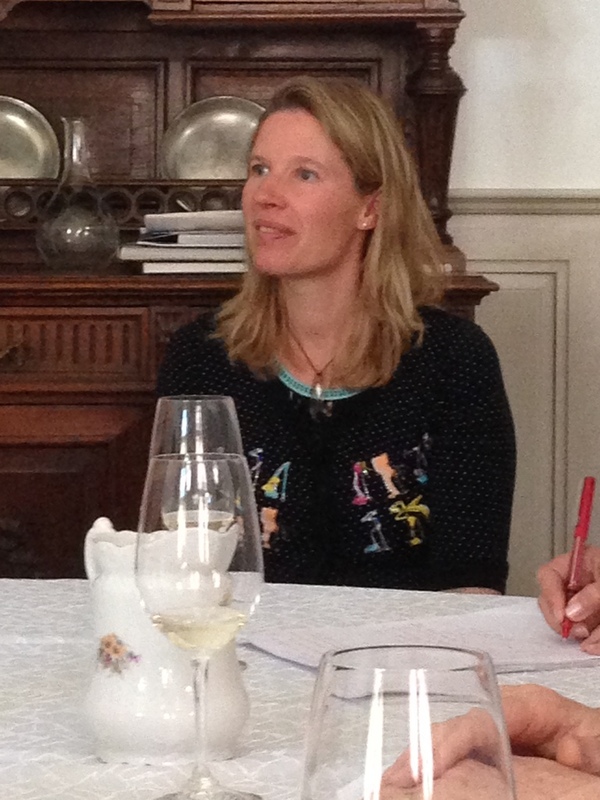 I have a feeling that Agathe is well on the way to be recognised as one of the brightest stars in Alsace.